In a large skillet, brown beef and onion. Add garlic and cook for one minute. Drain. Add spaghetti sauce and water to skillet and simmer for about 5 minutes. Pour 1 cup of spaghetti meat sauce into a 4- to 6-quart slow cooker. Place half of the noodles and half of the ricotta mixture on top of the sauce. Cover with 2 cups meat sauce. Top with remaining noodles (if the noodles don't fit exactly, break them to fit), cheese mixture and meat sauce. Cook on LOW for 4-5 hours or until noodles are soft, being careful not to overcook. (Don't try to speed up the process by cooking on high.) Sprinkle 1/2 cup of mozzarella and remaining Parmesan on top. Cover with the lid to melt the cheese and allow to sit 10 minutes before serving. Lasagna was one of the first things I made from scratch in college when I finally started cooking on my own full time. It was so much work, and when I was finished I had used every pan in the kitchen and was completely exhausted. When I finally tasted it, all could I mutter was..."eh." It was okay, but by no means worth all that work, and I would have taken a store-bought lasagna over what I had just slaved over any day. I didn’t have time for meals like that. I was a busy college student! I had boys to date, parties to attend and reality TV to watch. Whew...how things have changed. Now I have kids to chase, spills to clean and soccer games to watch. 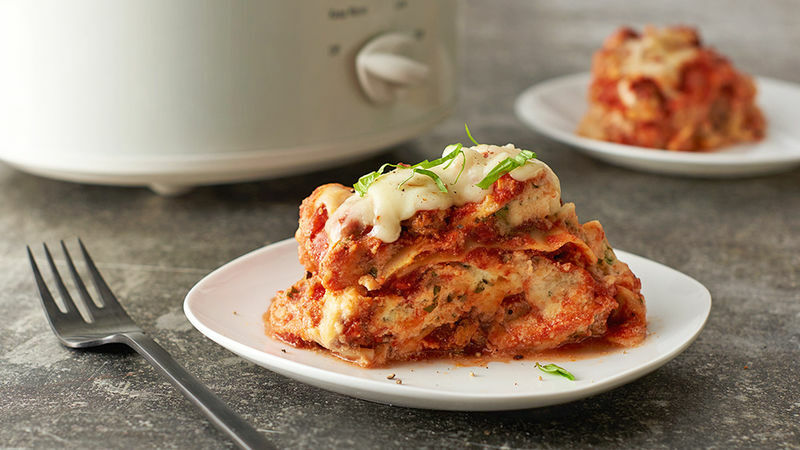 So when I came across the idea of slow-cooker lasagna, I was intrigued. For a busy mom like me, this kind of meal is ideal. I thought it sounded like a genius shortcut, but I had my doubts about whether it could really taste as good as the traditional version when it was so much less work. The preparation was quick and easy (almost too quick and easy, I thought). When we sat down for dinner, I even reminded my family that this was an experiment and I had no idea how it would turn out. But I didn't need to worry, because it turned out so good! I swore then and there that this would be the only way we did lasagna in my house from now on.